My desk. During Welcome Week. These types of posts are usually about what’s on our desktop..and or desk. However, my desktop is boring except for my super awesome desktop background which is in itself an organizational tool. But today I’m in the mood to cover the other half of this challenge. My desk. The literal top of my desk. Last year the entire Dean of Students area was facing a transition and it was asked of all staff to consider moving around rethinking our spaces. Long story short, I gave up a perfectly good office with windows for a space with no windows and concrete walls. Folks on video conference calls said I looked like I was in jail. However, there was a silver lining to the whole thing. I was given the chance to buy new furniture of my choosing since the room was empty to start with. This was a great compromise and I moved immediately. This picture will tell you the rest of the story. 1. My desk is the bomb. 2. My chairs are the most awesome and I’ve decided they are in the shade of my new favorite color. 3. Staples came out with a line of products in the same shade and I was ecstatic. 4. You’ll see remote controls since I’m in charge of the 13 televisions downstairs from my office in the food court. 5. I told you my desktop is boring. Its actually a new computer and I don’t have a good screensaver loaded. 6. The rest of the mess are maps, binders and related items all for this week’s events. I have outdoor movies tonight, an outdoor concert with Ferris Wheel tomorrow night, and an all day University Fest event Saturday. WHOO Wee. Seriously though, as I look at this picture, it really does tell you so much about me. Especially me in an incredibly busy time at work. For those of you who have already jumped the Welcome Week hurdle – Congrats. For those entering the fray – LET’S DO THIS. I’ve been using Google Drive apps personally for quite some time. I find that it’s more convenient for saving documents – especially if I’m working collaboratively on something with other people – to use a Google Doc or spreadsheet than sending an attachment via email. Needless to say, when I found out our campus was partnering with Google to bring Drive to campus, allowing us to create and share documents with our University credentials, I got very excited. We’ve been a Google Drive campus for about 6 months now, and it’s been great! Edit a document collaboratively with colleagues across campus: Not only can I track changes made by other user accounts, I can ensure FERPA guidelines are enforced by restricting access to either specific accounts, or to those within my University who have the link. Share documents across units or departments: I have found over time that we have made our share-drive for our department so locked down and restricted, that it is impossible to share documents across units or departments without sending massive email attachments. Through Google Drive all I have to do is send a link, or personalized email to a user, and they can either see or edit the document. You can revert back to old versions and see what content has been edited: Again, Google seems to have anticipated a common occurrence in the workplace: someone accidentally edits a document or deletes a key element you needed, and it saved before you had a chance to stop them. Good news! Google Drive tracks edits and allows the originator of the document to revert back to previous versions. So these are just some of the ways I have benefited from the use of Google Drive at work. In fact, Google Drive has been so useful, we used the spreadsheet function for our end of the year residence hall check out process (leave me a comment below if you’d like to know more about how we used Google spreadsheets for closing). How have you utilized Google Drive on your campus? My campus has seen a lot of changes over the last year, and my department in particular has seen a lot of seasoned staff leave. The result has been some restructuring of positions (all good, from my perspective), and new leadership at all levels. As someone who has been a part of the department for over a decade, it’s been refreshing to see new staff come in with new ideas on how to serve our students. A unique perspective I’ve had recently is bringing in new professional staff to take over roles I used to perform. You would think there would be a lot of ego involved in ensuring the tasks happen exactly the way I want them to (you know, the way I used to do it. Also known as the right way. ), but I have been pleasantly surprised with myself that this simply hasn’t been the case. I’ve been reflecting about why this is, and it occurred to me that one of the biggest tenants of leadership is learning to let others lead. It’s not about making sure the tasks get done the way I would do them, it’s about ensuring the staff have the training and skills to get the work done the way they want to. I make myself available to answer questions, and let my staff know that if they want my opinion I will share it, but I let them determine when they need my help, versus assuming they need my knowledge to thrive. Allowing them the autonomy to do it their own way allows them to take ownership of the work and experience for students and staff they serve. As we continue to bring in new staff, I hope to continue refining my skills in learning to let others lead, so they feel true ownership for the work they are doing. I’m not saying I’ve perfected this skill by any means, but I am saying I appreciate the benefits of humility in leading others. So what do you think? What does it mean to you to let others lead? Not a single one of my graduate classes or experiences truly prepared me for life as a new professional. … Okay. That’s only partially true. You just don’t know what it’s like until you live it. This past July I began a my job in Residence Life at an elite institution that is approximately 13 hours away from my home in Rhode Island and 15 hours away from my graduate life in Boston. I’m down here with a very limited support system and in full swing with my new job. As you can imagine (or potentially remember from your own experience), I’ve been a tad bit overwhelmed. And it wasn’t until this month began, that I finally started to get myself grounded. Let me start by saying, that I have some of the world’s greatest frolleagues (you know, friend-colleagues). They have been incredibly supportive and great mentors throughout my transition. Without them, I would be completely lost. While I once would have liked to believe that I was the captain of my own ship, I’ve recently learned the following: you cannot do it alone. You cannot do it all. And you cannot forget that. I typically work a 50+ hour work-week. It’s never less and sometimes it’s more. I answer emails all day, every day. I let my staff members text me with questions. I live where I work. I work where I live. I continue to talk about work with anyone who will listen at any point in any day. And I’ve recently discovered just how stupid I am being. That is a great way to burn myself out in year one. So, what have I done (and what can you do) to bring back the balance? Leave the office at dinner time. Yes, we all stay later. And that’s fine. But not at the expense of your own health. For the love of Pete, there will always be more work to do. Leave it and eat a sandwich. Stop checking your email all night. Oh, hello iPhone, you devil, you. While it truly is wonderful to check email on-the-go, those nights where I let it charge and ignore the buzz are the ones where I am the least anxious and most relaxed. If there is an emergency, someone will call you. Go off the grid on the weekends. It isn’t until I leave town that I truly feel free. No laptop. No “homework”. No nothin’. Don’t be afraid to ask for help. I think I spent eight straight weeks avoiding asking more questions than I thought were appropriate. That was dumb. It’s better to know than to assume. Plus, everyone wants you to do a good job anyway. Call your friends and family. Do you remember that wonderful invention called the telephone? Use it. Friends and family keep us sane. At the end of a long, hard day, it helps to hear the voice of someone you love. The moral of my story? Unplug when you need to and don’t be afraid to ask for help. Since I’ve recognized the need to change in me, my mood has improved, my overall happiness has increased, and I feel more confident in my position. (And it’s a good thing I didn’t agree to write more blog posts this season, otherwise there would have been more on my plate and less in my outbox). As I discussed in a recent SAWTT post, I recently embarked on a quest to get more fit. As part of that quest, I’ve been using my FitBit more regularly — and noticed that the daily “Time Active” pie charts often show the percentage of time spent as “sedentary” (vs. active) as 60% or more. In other words, I spend about 60% of my non-sleeping time sitting on my rear (whether at the office, in meetings, or on the sofa at home) — and this is despite my new regimen of going to the gym or walking outside 7-8 times per week. Given all the studies demonstrating that that much sitting is unhealthy, I decided that it was finally time to set up that standing desk I’d been considering for a while. Comfortable shoes are a must (some folks I know who use standing desks prefer to stand without shoes. I haven’t tried that yet). Don’t forget to take breaks — standing in one position can also be bad for posture, back, etc. I made sure to install BreakTime on both computers and use the app to remind myself to move around periodically. So far, I am happy with the setup and liking the experiment — and will report back again after I’ve had more time to try it out. What about you? 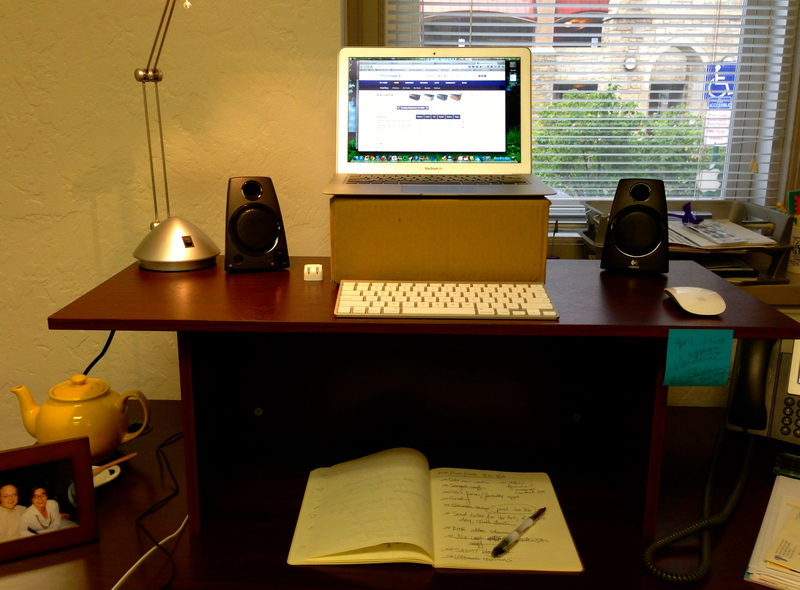 Do you use a standing desk? If yes, what has your experience been like? It’s September, and I work at a quarter school. Over the next month I will be training staff and getting 4600+ students moved onto campus. I will certainly be busy, and justifiably so. This is the busiest month of the year for me, and I expected as much when I got into this work. That said, I think there’s a degree to which we find a certain satisfaction in being busy. Busyness equates to self-worth and job security in a way that is often more smug than accurate. As I watched most of my colleagues around the country go through their busy season in August (yay semester schools always being ahead of the curve), I took mental notes of things I’d like to try on my own campus, or lessons I could learn from others. I never questioned the fact that when someone mentioned they were busy that it was true, because I know what they were going through. Busy starting (or ending) an academic year is one thing, but at what point are we always busy? I see a lot of posts on Facebook from friends who seem to always be working, and always be looking to be told how great they were for always working. What’s the point? When do you stop working and start living? A couple of friends posted this article on Facebook over the weekend that articulates very well how we seem to equate how busy we are with our importance – like some sick status indicator. I work 14 hours a day, which means I’m more important than you! Ridiculous. So how do we keep from perpetuating this busy culture? Don’t take on more than you can reasonably accomplish. Seems like a no-brainer, but it seems that we’ve created a culture where people feel they have to always take on more tasks or they will replace you with someone who will. Are we really that insecure? I really don’t think our supervisors are that cunning. In my experience, a good supervisor may not know how busy you are unless you tell them. If they try to give you a project, and you have another deadline looming, tell them you can’t take that on and why you can’t. Schedule your time better. Some of the people who I’ve heard complain the most about being busy seem to have plenty of time to do things like play on social media all day. It’s these same people who get “surprised” by a deadline because they didn’t manage the time they had wisely. Try scheduling time on your work calendar to work on a project to see if this helps you with time management. Also, if you can’t balance the time you spend on social media vs. the time you are working, then I suggest you stay off social media. Ask for help. This one seems to be the hardest thing for most people to do. For some reason, we seem to have an insane amount of ego wrapped up in being the “go-to” person at work, which results in long hours and eventual burnout. No one expects you to work 15 hours a day in order to get everything accomplished! Who knows, maybe asking for help will result in the addition of staff to assist getting the work done. These are some of my ideas on how to keep from perpetuating the busyness myth. What are yours? Prezi: A few years ago, Prezi was all the rage for presentations. 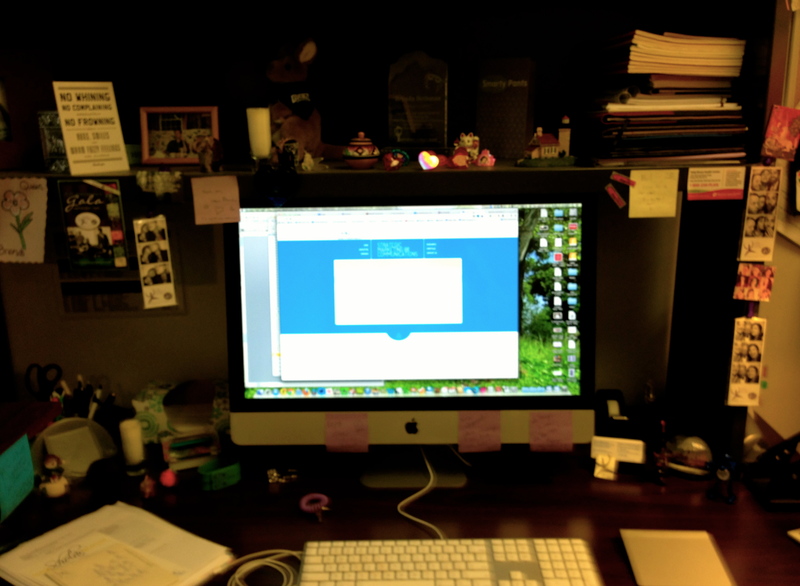 As someone who typically embraces new technology, I was eager to learn Prezi. While I enjoyed the online platform utilized for Prezi, and the ability to edit a presentation with co-presenters, I never felt like the usability became intuitive for me. Sure, I could put together a decent presentation, and knew not to have the path of travel jump around, but I felt like I had to re-learn how to use Prezi each time I created a new presentation. Not exactly what you’re looking for when needing to create a presentation. Dropbox: One thing I’ve really found useful, especially when working collaboratively on research projects, is the use of Dropbox. Dropbox allows you to save data on servers that can be accessed anywhere. If someone has permission to access your server repository, they can access the data you have there, and use it for whatever collaboration project you are working on. While there is no specific presentation platform associated with Dropbox, I do think it’s helpful for shared data storage – especially if there is a significant amount of data to share. Google Drive: Lately I’ve been using the software available via Google Drive for a variety of things, including presentations. Google Drive has an application called “presentation” that resembles PowerPoint, which has made the learning curve very small. Google Drive Presentation also allows you to work on something online, and therefore provides the capability to edit a presentation collaboratively. I have been able to work on a presentation simultaneously with a colleague in Chicago, and see the changes she makes instantaneously. Plus, it helps that Google Drive saves automatically and frequently. The last thing you want is to spend a ton of time on a presentation only to lose it when you don’t save it. So those are some of the presentation platforms I have used recently. What are your favorites?